Arjuna Dasa : In Mauritius, Sir Seewoosagur Ramgoolam, one of the Prime Minister's right-hand men, was very friendly with the devotees. In those days, although officially there was no apartheid, the apartheid mentality of South Africa had spilled over into Mauritius and the few French families employed the rest of the population. When Ramgoolam heard that white people bowed down to Prabhupada, he was impressed and wanted Prabhupada to come to Mauritius. Ramgoolam asked the devotees, "Please draft a letter to induce your spiritual master to come and I will sign it." The devotees wrote, "Will Your Holiness please come and bless our island, and please bring your Krishna Consciousness Movement," and Ramgoolam signed it. At that time Prabhupada was a little reluctant to travel but since a head of state had invited him, he came. Mr. Tilak, the Secretary of Parliament for Agriculture, escorted Prabhupada off the plane and then Prabhupada attended a very nice reception in the VIP lounge, where foreign heads of state are honored. 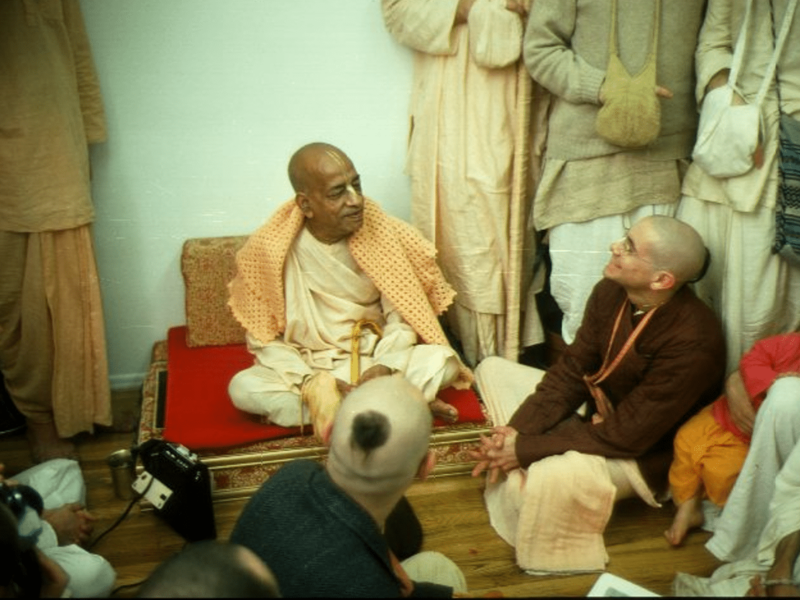 It was the first time Prabhupada had had such a reception. The first thing Prabhupada said was, "yad yad acarati sresthas tad tad evetaro janah. Whatever the leaders do, common men will follow." Throughout his visit he was meditating on this and he gave many instructions on how to set up a perfect Krishna conscious society. Mr. Tilak brought 40 members of Parliament and heads of state to meet Prabhupada, and for about 40 minutes Prabhupada gave them a blueprint of how to set up an ideal society. In January 1976, a transcript of part of that talk was printed in Back to Godhead magazine. Srila Prabhupada said that Vedic society is based on love and a perfect society can be set up in a small place like Mauritius— it is no longer possible to do this in a highly industrialized state. And Prabhupada said, "We don't have to invent anything new. The Vedic histories have already given examples of perfect Vedic societies. A perfect society is based on love, not on law. If the citizens love you, then they will automatically want to follow your laws. But first there must be love. So, Bhagavad-gita teaches that we must put Krishna in the center. If we govern according to Bhagavad-gita, we will get perfect society."